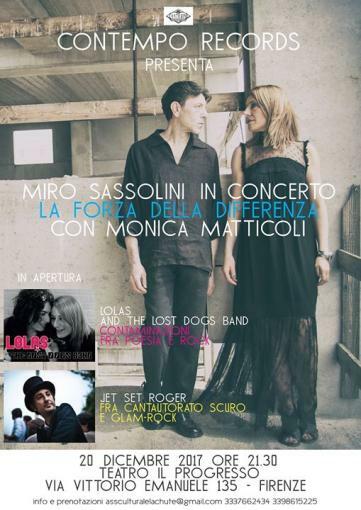 the return to Florence of the singer MIRO SASSOLINI, historical voice of the Italian new-wave, melodist and vocal experimenter. Together with MONICA MATTICOLI, author, performer and poet, Miro Sassolini retraces the last eight years of research on the borders between music, song and poetry in an exciting electronic version to bring out the voice and the word. With the precious contribution of the musicians Daniele Vergni and Paolo Careddu, Miro Sassolini proposes a selection of pieces taken from his solo repertoire. It will be possible to listen to some songs from the album "Del mare la distanza", released in recent weeks with the Contempo Records label, concept and texts by Monica Matticoli and artistic production by Cristiano Santini and Gianni Maroccolo. The live will not fail to mention the more experimental Miro: the publication of the poem "L'essenza dell'io", written with the musician Marco Olivotto and published as an appendix to the book by Monica Matticoli "L 'unrepeatable search' (Oédipus Edizioni). "The power of difference" is a minimal, elegant, lysergic live: for those who love getting lost, or finding themselves, in the images of poetry and in the expressive power of one of the most kaleidoscopic voices of Italian music. Before Miro Sassolini will perform the LOLAS AND THE LOST DOGS BAND: the group, founded by the performers Monica Matticoli and Valentina Tinacci together with the musicians Maurizio Regoli, Giacomo Gandolfi and Luca Lombardini, offers a small rock & poetry concert with poems taken from the book by Matticoli and Tinacci "Venti lucenti nails" (Premio d'if 2009) and original music. The protagonist of the show is the possibility of reciprocal contamination and reinterpretation - a true hybridization - between song and poetry. In live, the rhythm of the recited verse and the musical progress proceed superimposed, opening up unexpected soundscapes, in a dimension where one begins as a poem and ends, almost, as a song. The evening will be opened by the singer-songwriter JET SET ROGER, who will perform, piano and voice, some pieces from his repertoire and from the latest work "Lovecraft nel Polesine" (Snowdonia / Audioglobe), attended by well-known musicians such as Andy Rourke, Marco Pirroni and Giorgia Poli. The album is a comic concept with boards created by Aleksandar Zograf and inspired by the bizarre "journey impossible" of the writer HP Lovecraft. Dark singer-songwriter for a refined and twilight live, with glam-rock atmospheres.